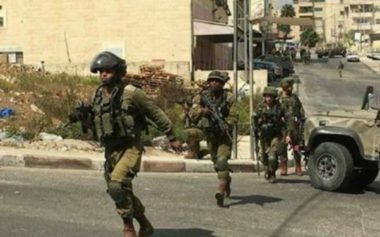 Several Israeli army jeeps invaded, on Thursday at dawn, the town of al-Khader, south of the West Bank city of Bethlehem, and stormed a few shops, before inspecting surveillance recordings. Ahmad Salah, the coordinator of the Popular Committee against the Annexation Wall and colonies in al-Khader, said the soldiers invaded many shops, on the main Jerusalem-Hebron road, and searched them while inspecting their surveillance recordings. He added that the soldiers also invaded and ransacked the home of a political prisoner, identified as Ahmad Khaled Mousa, and withdrew from the town.